The Port of Portland Commission will begin discussion of the Fiscal Year 2016-17 budget at a public hearing during their regularly scheduled meeting at 9:30 a.m. Wednesday, April 13 at the Port’s headquarters building, 7200 N.E. Airport Way. Public comment is welcome. Then on May 11, Port Commissioners will consider preliminary approval of the FY 2017 budget, which allows for review by the Multnomah County Tax Supervising and Conservation Commission. The TSCC will hold a public hearing on the budget on June 8, and the Port Commission will consider final adoption of the budget at a special Port Commission meeting later in June. Total Port operating revenues and operating expenditures are budgeted at $288 million and $191 million respectively for FY 2017, compared to the FY 2016 adopted budget of $295 million and $190 million. The operating revenue decrease is due to lower marine maintenance reimbursement revenues and lower associated expenses. Industrial development land sales are budgeted to decrease $14.1 million from $24.6 million in FY 2016 to $10.5 million in FY 2017. Some parcels budgeted in FY 2016 are now expected to close in FY 2017. 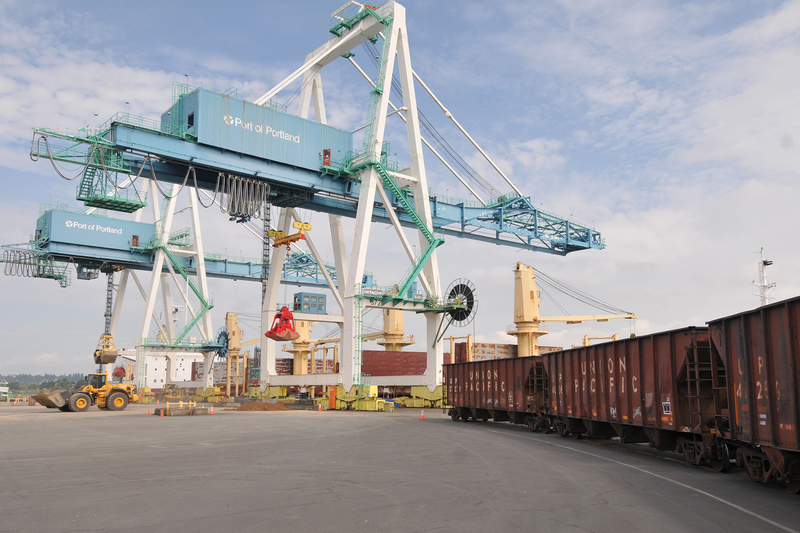 Ninety-six percent of Port revenues come from user-based fees for service including airline, rental car, parking and concessions revenue, as well as marine terminal leases and fees, land sales, and other long-term leases. Approximately $11.4 million of the Port’s budget comes from property taxes, or about 7 cents per thousand assessed value. The strong dollar continues to reduce the buying power of overseas customers and is putting downward pressure on marine export growth. Despite these external market forces, breakbulk (i.e. lumber, steel, barite ore, machinery, etc. ), largely handled at Terminal 2, looks promising with the continued level of activity, as well as the potential for new opportunities and new markets in FY 2017. The forecast for auto volumes is an increase of 16 percent in FY 2017. Increased volume is forecast across the board for Toyota, Honda, and Auto Warehouse Company, which includes Hyundai imports as well as Ford exports to China and Korea. Portland is the fourth largest auto import gateway on the U.S. West Coast, and ninth in the nation for auto imports. Facility improvements at Columbia Export Terminal (grains) and Portland Bulk Terminals (potash) were well-timed for the sluggish market and are poised to increase quality, production and competitiveness when a stronger marketer returns. FY 2017 marine operating revenues are budgeted to decrease approximately 17.4 percent or $5.7 million from the FY 2016 adopted budget, primarily due to lower reimbursements for maintenance expenses at Terminal 6. Travel at Portland International Airport has been on the rise. Approximately 18 million passengers are expected to travel through PDX in FY 2017, setting an all-time record, with a 7.6 percent increase over the FY 2016 adopted budget. This growth is a result of continued improvement in the local economy and new investments by the airlines serving PDX with 15 new nonstop domestic routes and a new international nonstop route. Service to Toronto, Ontario, the newest international route, starts May 26, representing PDX’s 10th international destination. The FY 2017 PDX operating revenues, including airline, rental car, parking, and concessions revenues, are budgeted to increase approximately 4 percent or $8.4 million from the FY 2016 adopted budget. FY 2017 commercial properties operating revenues are budgeted to decrease 57 percent or approximately $14 million from the FY 2016 adopted budget. Some parcels budgeted in FY 2016 are now expected to close in FY 2017. Strong interest continues in the Port’s industrial business parks as the industrial real estate market continues to experience increased rental rates and historically low vacancy rates. FY 2017 will see continued investments in maintaining existing assets and infrastructure with a capital budget of $205.3 million. Major projects at PDX include terminal building improvements such as terminal balancing/efficiency improvements and access control replacement. PDX will also see the expansion of the rental car quick turn-around washing and fueling facility and continued rehabilitation of airfield taxiways. In addition, to ensure the Port’s business park properties are ready when customers are ready, the capital budget includes the continuation of phase two development at the Troutdale Reynolds Industrial Park. Other General Fund capital investments include navigation equipment upgrades, runway rehabilitation at Hillsboro Airport, construction of an auto staging facility at Terminal 6, a new overcrossing in the Rivergate Industrial District, and technology equipment, infrastructure, and software upgrades. Beginning April 13, copies of the FY 2017 budget are available on the Port website at www.portofportland.com.